Pentax *ist DL (*istDL) is one of the smallest, most affordable and simple to operate starter digital SLR (dSLR) in the market. Pentax *ist DL is the sibling of the Pentax *ist DS2 (*istDS) with slightly fewer features such as using less sophisticated autofocusing system and mirror in the viewfinder instead of a prism, and a larger body. Pentax *ist DL features 6.1 megapixel CCD, sophisticated 16-segment multi-pattern metering, 2.5-inch LCD monitor, SD media Card storage, USB 2.0 connectivity and 11-point autofocus with SAFOX VIII. 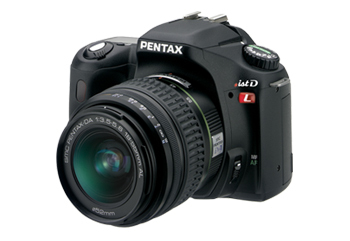 Pentax *istDL comes with a 18mm-to-55mm lens, and weighs 16.6 oz. w/o battery. More specifications, features and sample photos at Pentax *ist DL official homepage (no longer available).